The teak bowl was re-launched by Architectmade in 2014 is just one of a large collection of bowls that were originally designed by Finn Juhl in the 1960’s and produced by fellow designer Kay Bojesen. Architectmade is a Danish design brand specializing in small accessories designed by well known architects and designers. 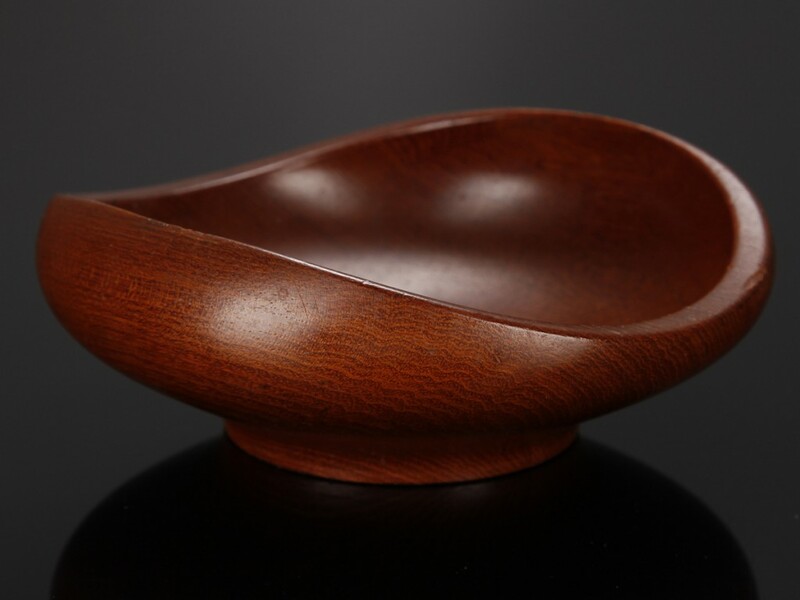 They got the rights to produce the teak bowl again from the Finn Juhl foundation. 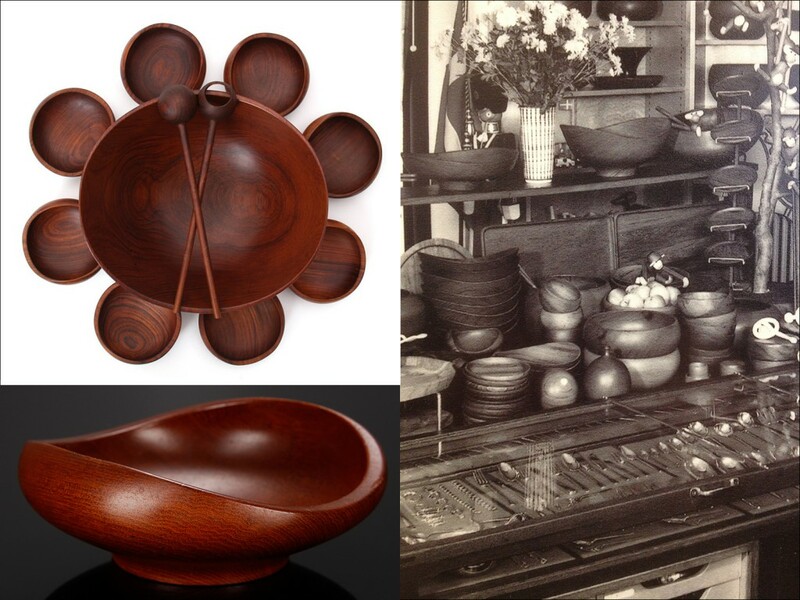 The original teak bowls designed by Finn Juhl and made and sold by Kay Bojesen. 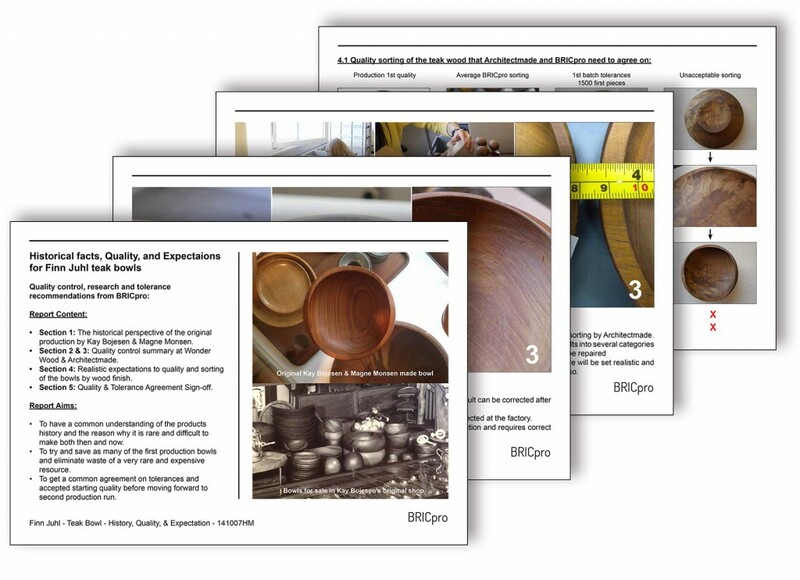 I researched the original production techniques and quality of the bowls made in the 1960’s by visiting a Kay Bojesen exhibition, meeting with wood craftsmen and inspecting antique examples of the bowl. 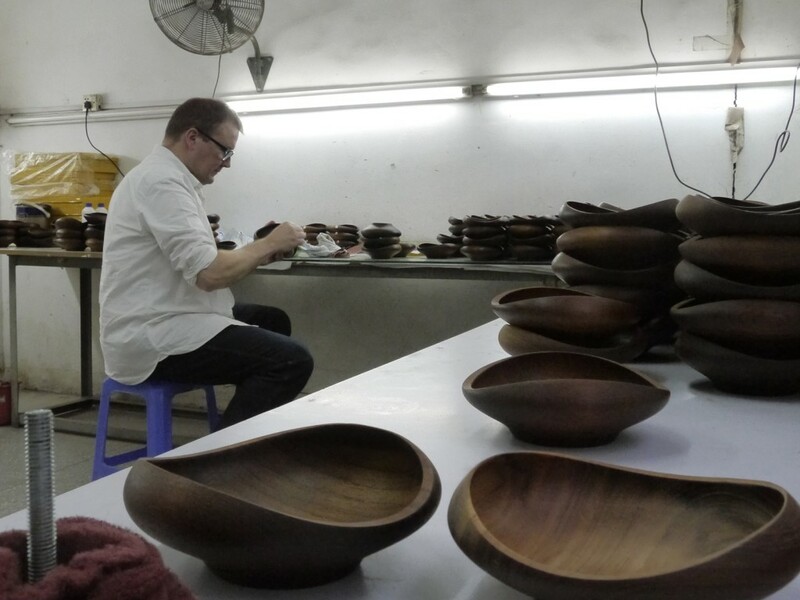 By making instructional videos and reports for the factory in China, I used my knowledge of teak wood to instruct the manufacturer in the correct sanding and oiling treatments needed to achieve the correct surface finish on the bowls. Here I am carrying out a quality control inspection of an entire batch of bowls at the manufacturer. 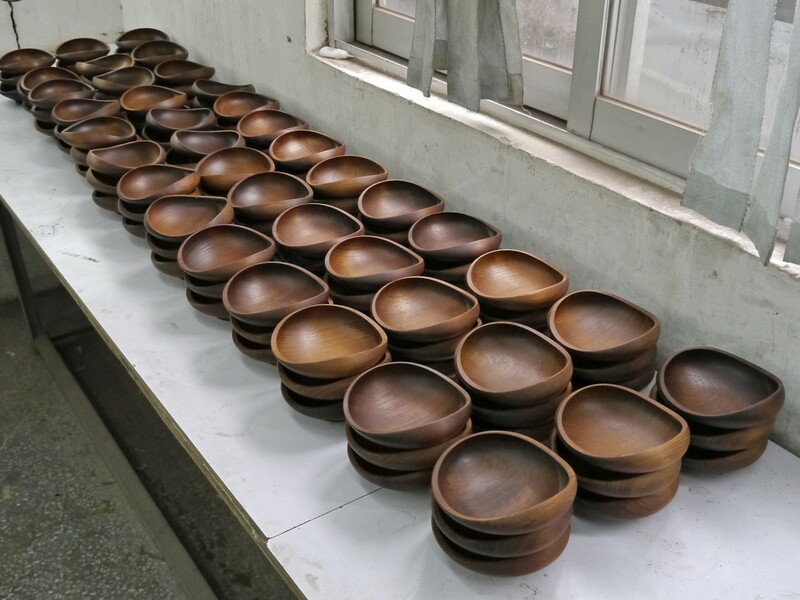 I significantly reduced the amount of bowls being rejected by the client by educating them about the material they were working in, showing them my research of the original production, and helping their own quality control team to give the correct oil treatment prior to packing. I negotiated a joint quality control agreement between the client and the factory that consolidated the client expectations with what was physically possible at the manufacturer. Bowls that I personally sorted and oiled, ready for packing and delivery to the client. I collected all the product data in a master document that was also used to keep the communication between the client and the factory up to date. This became a specification sheet master for BRICpro who I was working for and a document that could be adjusted and customised for other product types. The whole development process was documented in a series of data sheets and reports to make sure all agreements on quality and finish were in writing. Several of these were also translated to Chinese by BRICpro to ensure no misunderstanding between the client and factory. 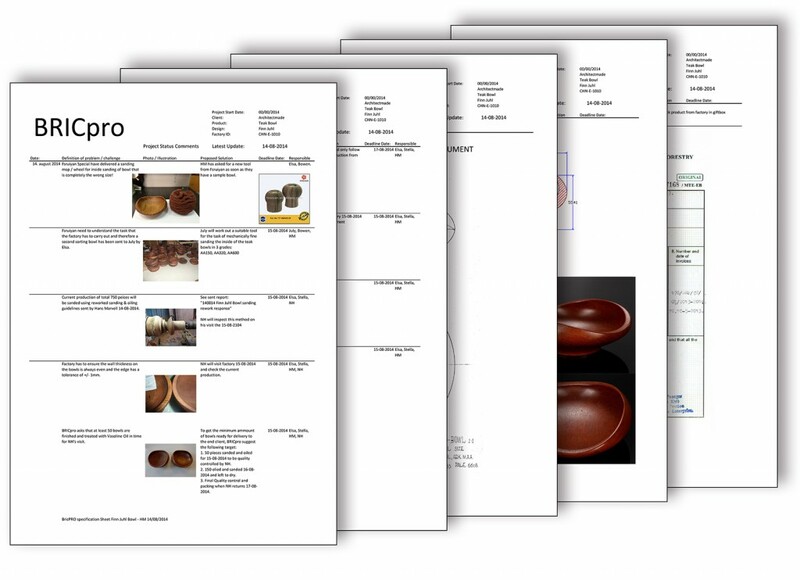 Teak bowl specification sheet made for BRICpro. During my involvement with the product development on this product I carried out several quality controls and tests. This culminated in a final written agreement that I negotiated between the factory and client so a balance could be reached between what was desired and what was possible. In my experience with carrying out quality controls I try as much as possible to make measurable definitions of required finishes and dimensions. With the Finn Juhl bowl there were many difficult surface finishes that could only be described visually and defined in descriptions of physical inspections. This was a very hard product to set realistic Q.C. standards but an agreement was reached by spending time educating both the client and the factory on the properties of the teak wood used. Part of a long written agreement on the expected quality to be delivered. The original 1960’s production was actually made by one master craftsman, Magne Mogensen, and Kay Bojesen’s company failed to move the production to U.S.A. because the craftsmanship needed could not be industrialized on a larger scale. Therefore original bowls only exist in small quantities and demand high auction values. With my assistance, BRICpro’s factory managed to use a combination of modern CNC techniques and manual craftsmanship, to make this product on a larger scale. I helped the Architectmade and BRICpro get the product to market and ensure a correct production procedure for future batches. With real Tectona Grandis Teak being both endangered and limited in supply from plantations, I ensured a much lower waste rate of the raw material.